The way in which a spacecraft increases or decreases its kinetic energy by swinging around a moving planet is very similar to the way a certain type of water turbine, the Pelton Wheel, extracts energy from a fast jet of water. Lester Pelton, the inventor of the device, was born in 1829 in Vermillion, Ohio, on the shores of Lake Erie. In 1850 he arrived in California among the gold rush migrants and became a fisherman on the Sacramento river. Around 1853 he gave up on fishing and started working in the gold mines of Camptonville, Nevada City and Grass Valley, on the Yuba river in the "mother lode country." In 1864 he became a carpenter and millwright. By that time the search for gold had progressed from sifting creek gravel ("placer mining") to processing large amounts of ore--from gravel deposits on the surface and from hard-rock mining. This required power--to drive stamp mills that crushed the ore, to pump air into mine tunnels and later to provide electricity and compressed air. Some mines used steam engines, but these needed a large and constant supply of firewood. Mountain creeks could also supply energy, but the amount of their water was rather limited, although it fell from great height. Therefore, instead of the slow (and inefficient) water wheels traditionally used by flour mills, which needed only a moderate height but used a large amount of water, mine owners installed turbines--wheels with cups around their circumference, on which a fast jet of water was directed, coming from a high-up reservoir. Efinal = (m/2) (vfinal)2 is increased. vfinal = –u The final velocity has the same magnitude as the initial one, only the direction is reversed. The energy is unchanged. vfinal = –u + 2v is the sum of a positive number (-u) and a negative one (2v). Its magnitude is therefore less than the magniitude (-u) of the initial velocity: the ball comes out moving more slowly than before. Its energy is reduced. vfinal = 0 and the ball just dribbles out with no velocity of its own. Encounters between a moving planet and a spacecraft behave very much in the same way. Head-on encounters increase the energy and overtaking encounters decrease it. In encounters where both planet and spacecraft move along different directions, the energy can also increase or decrease, depending on conditions, and in addition the direction of motion changes. Sometimes losing energy is just what is needed. Suppose a scientific probe is to be sent to the Sun. A spacecraft which has escaped the Earth´s gravity still circles the Sun at about 30 km/sec, and to escape the solar system it needs an added push of about 12 km/s. To reach the Sun is much harder: the spacecraft needs (at the very least) to lose all its orbital velocity, which requires a boost of 30 km/sec against the direction it is moving. Once all its velocity is lost, it falls freely sunward. NASA´s Solar Probe, meant to approach the Sun within 4 solar radii (about 2% of the Sun-Earth distance), has similar requirements. As far as rocket power is concerned, the most economical way of achieving that mission (though not the fastest) may well be sending the spacecraft outwards towards Jupiter, 5 times more distant from the Sun. It would then make a tight loop around the planet, overtaking it in such a way that practically all its orbital velocity around the Sun is lost, and then fall towards the Sun. Perhaps the most ambitious attempt to give up orbital energy by means of gravitational encounter with a moving planet has been the Messenger mission, launched in 2004 and achieving in 2011 an orbit around the planet Mercury. The mission was hampered by the need to approach the Sun to the distance of the closest planet, and therefore, losing most of the orbital energy it had near Earth; it also had to cope with intense heating close to the Sun, making necessary a "sunshade" shield. And there was an additional complication: Mercury is so small, its gravitational pull so weak and its escape velocity so low, that a spacecraft must come very close to matching velocities with the planet before it can be "captured." "Messenger" had to give up much of its energy and reach Mercury with just enough velocity to be captured. No fewer than 6 energy-reducing maneuvers were therefore required. Three of these have occurred before 2008--one with Earth and two with Venus--and on January 14, 2008, the first of 3 Mercury gravity-assist encounters occurred. Messenger approached the planet down its magnetotail and passed very close to the surface, that closeness making possible images of much better resolution than those of preceding missions. The magnetic field was about 150 nT, close to the one expected. The final Mercury orbit was achieved in March 2011. Even then, the orbit was be rather elliptical, and the spacecraft spent only a small part of it near the planet. Unfortunately, once any orbit is achieved, further gravity-assist encounters are ruled out. The mechanical behavior of a spacecraft encountering a moving planet, along its line of motion, is very similar to that of a water jet hitting the edge of a hemispherical cup-vane in a turbine wheel, where its motion is turned around by 180° (drawing). If the vane does not move, the only effect is to reverse the jet´s direction. Apart from some energy lost to friction, the energy of the jet, and the magnitude of its velocity, stay the same as before. As with the spacecraft, if the vane moves towards the jet, the water gains speed; if it overtakes a vane moving away, it loses speed. In particular, if the water overtakes a vane moving at half its speed, then (neglecting friction) it loses all its velocity and just dribbles out of the moving vane. Total energy is always conserved. Neglecting friction losses (which are converted to heat), the kinetic energy lost by the jet is converted to additional rotational energy of the turbine wheel, speeding up its motion, or perhaps helping run machinery connected to it. By adjusting the speed of the jet to be equal to twice the speed of the vanes, almost all of the jet´s energy can be converted into useful output. [A problem with the De-Laval turbine is that cannot easily attain this condition. Though the steam jet converts heat energy very efficiently, to efficiently extract energy from it, the turbine wheel should match half the jet's velocity. But the jet's speed is more than the velocity of sound; if it moves at (say) twice the speed of sound, the periphery of the wheel should be moving at the speed of sound, which is too much for machinery. That was Pelton´s great discovery. In other turbines the jet hit the middle of the cup and the splash of the impacting water wasted energy. In technical terms, the impact there resembled an inelastic collision, whereas in the turbine which Pelton developed, the deflection of the jet resembled an elastic collision, like the encounter between a spacecraft and a moving planet. Through the later 1870s Pelton developed his design, settling in the end on a double cup with a wedge-shaped divider in the middle, splitting the jet--half to the left, half to the right. (You can approximate that design by cupping your hands upwards, then bringing them together, with the fingernails of one hand touching the ones of the other.) In the winters of 1877 and 1878 he tested turbines of different sizes, including a small one for running his landlady´s sewing machine (it worked, but he was not happy with the design). In 1880 he also obtained a patent on his invention. Pelton then tried to sell his turbines, but met with little success until the spring of 1883, when the Idaho Mining Company of Grass Valley in Yuba County, California, arranged a competition between different designs, before deciding which design it would buy. Pelton´s turbine won by reaching an efficiency of 90.2%, whereas the three competing water wheels only attained 76.5%, 69.6% and 60.5%. 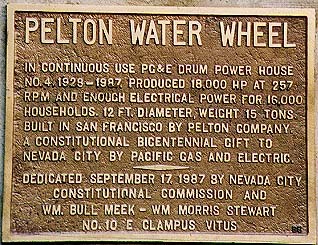 After that sales grew at a tremendous rate, and in 1888 Pelton with some partners formed in San Francisco the Pelton Water Wheel Company, which expanded production even more. While Pelton´s turbines were installed all over the world, some of his best customers were right in the "mother lode country" where he began his career. The biggest Pelton wheel ever built measured 30´ across and is now on display in Grass Valley, while a 15-ton wheel, on view in nearby Nevada City (its image at the beginning of this section and its memorial plaque is portrayed above), provided 18000 horsepowers of electricity for nearly 60 years. Pelton ultimately moved to Oakland, on San Francisco Bay, and died there in 1908. He never married. Purely for humorous wasted time, look up who put up the plaque--named on bottom line. Afterword: "Do Frogs exist there too ?" Updated 1-10-2008, edited 26 October 2016.